I have a funny relationship with Christmas. I love the festive season but not too early. Decorations in October? Adverts in November? Not for me, it gets on my nerves. But usually a week or two before the big day I get swept up in the holiday season. This year my Christmas spirit arrived earlier than usual and rather strangely through the horror comedy Krampus, about an evil Christmas spirit, and I don’t mean your dad’s homemade sloe gin. Krampus was written and directed by Michael Dougherty (the man behind cult horror Trick r Treat) and stars Adam Scott (of Parks and Rec fame) and Toni Collette (from The Sixth Sense), as well as a few other recognisable faces. The film begins as a traditional dysfunctional family Christmas; unwanted family coming to stay, issues at hand and things not being ready on time. In fact the opening scene set in a shopping mall is brilliantly done. 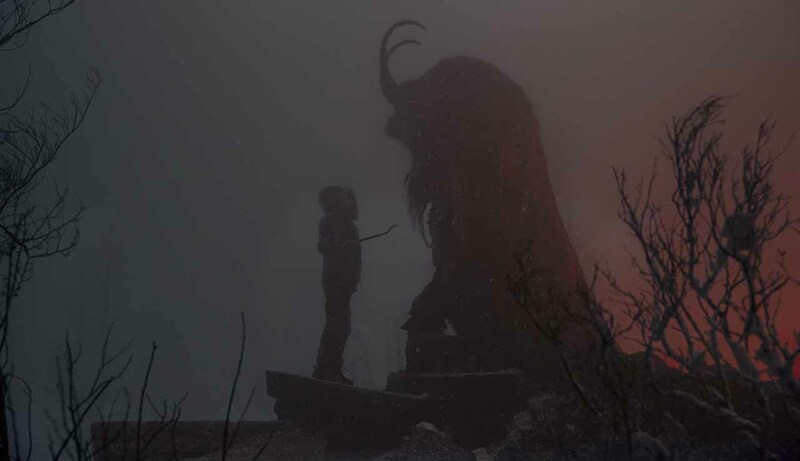 Things come to a head when youngest child Max – after bullying by his cousins and the contents of his letter to Santa being revealed – stops believing in the real meaning of Christmas and accidentally invokes a horribly dark and evil incarnation of Santa, Krampus, encountered once many years previous by Max’s gran Omi. The film plays for laughs as much as it plays for shocks and scares, which was something I did not expect going in, thinking it would be a straight forward horror. Whilst it is a horror film and is extremely dark in places – horrible creatures taking children and so on – it certainly draws influence from the likes of Gremlins and Cabin in the Woods, playing up to many horror tropes. Evil gingerbread men and toy robots get as many laughs as they do jumps. You also get a creepy feeling. Elves, snowmen, toys and reindeer should not be twisted and intimidating but here they are and with good effect. Performance wise everyone is good but not great. No-one stands out as amazing but as a cast they pull together to make the film funny and very, very dark. Krampus himself is a creepy and intimidating creature, briefly seen until towards the end, and you almost want the real Father Christmas to swoop in to banish Krampus back to the underworld. With so many films, past and present, being overly saccharine and ramming Christmas down our mince pie filled throats and falling flat, Krampus almost scares you into believing in the true meaning of Christmas. If you want to start feeling Christmassy, don’t bother with Love Actually, Muppets Christmas Carol or Die Hard, but instead watch this ho-ho-ho-rror and let Krampus make your spine tingle all the way.